Historically, IMA World Health’s Tanzania team has been eager to expand our reach and explore new solutions to advancing health, healing and well-being for all. At the start-up of IMA’s first-ever field office in 1997, IMA led a team of partners in targeting the neglected tropical disease onchocerciasis. Today, IMA’s presence in Tanzania reflects an expanding, comprehensive public health program with deep-rooted partnerships that have addressed wide-ranging challenges such as HIV prevention, testing and treatment; Burkitt’s Lymphoma; cervical cancer and more. A new focus on nutrition programming aims to make a brighter future by reducing stunting among children under age 5. 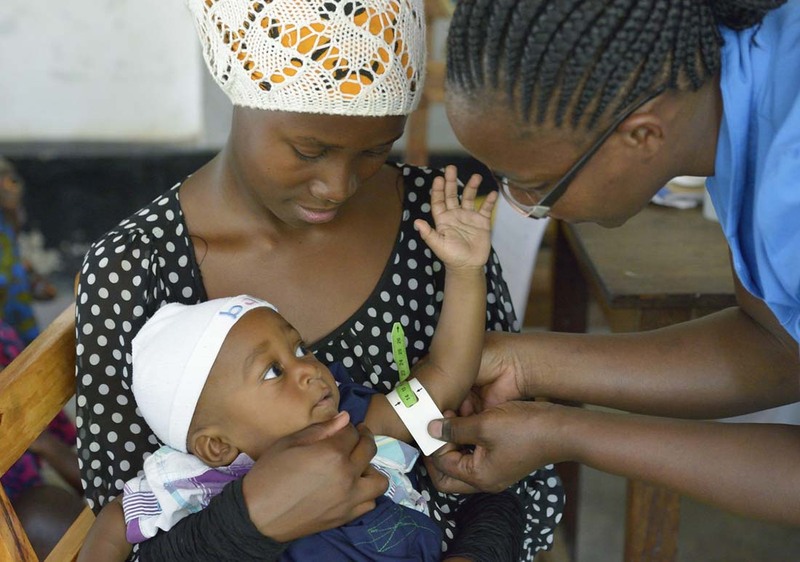 IMA works closely with the Tanzania Ministry of Health and a network of partners to determine the best, most cost-effective solutions to reach as many children and families as possible. IMA continues efforts in the country to control and eliminate NTDs, a priority as much as it is a point of pride. IMA’s NTD work addresses morbidity management and social stigma, so that Tanzania’s most vulnerable can achieve the health, healing and well-being IMA envisions for all. IMA World Health is leading the new DFID-funded Addressing Stunting in Tanzania Early, or ASTUTE, program. Our consortium, which includes the Partnership for Nutrition in Tanzania, Cornell University’s Division of Nutritional Sciences, and Development Media International, builds the capacity of local government authorities to address child stunting and contribute to the evidence base for what works best and most cost-effectively in Tanzania. ASTUTE activities will ultimately be implemented in all districts of five regions of the Lake Zone—Kagera, Kigoma, Mwanza, Geita and Shinyanga—representing a collective population of 10.2 million and more than 750,000 stunted children. These regions were selected for their documented high rates of stunting and anemia, high numbers of stunted children, low levels of appropriate child feeding practices and the potential to leverage local resources, including the presence of partner civil society organizations. ASTUTE aims to build the capacity of 50 local CSO partners; train more than 3,600 district nutritionists, community workers, health facility workers and non-health sector service providers; reach 3 million mothers, caregivers and decision makers with improved child care and feeding information; and reach more than 8 million people with a broad, multi-pronged communication strategy. IMA, with ENVISION support, follows the lead of Tanzania’s National Tropical Disease Control Program and its Neglected Tropical Disease Secretariat to implement NTD control activities in line with the Tanzania NTD Master Plan. Since 2011, IMA has supported Tanzania’s Ministry of Health and the NTDCP to provide technical assistance,funding, and capacity development for NTD control and elimination activities, and improved monitoring and evaluation for NTD program activities. The five NTDs endemic in Tanzania are lymphatic filariasis, onchocerciasis, schistosomiasis, soil transmitted helminthes and trachoma. A large portion of the population is at risk of co-infection with two or more of these diseases. IMA collaborates with health officials to carry out mass drug administration in 19 regions and 126 districts across Tanzania. To accomplish this, IMA worked with officials to train 11,414 frontline health workers, 27,087 teachers and 90,284 community drug distributors who delivered treatments to more than 20 million people by the end of fiscal year 2016. In addition, IMA provides technical support for carrying out disease-specific assessments for the five NTDs. IMA is the lead implementing partner in the Mtwara region of Tanzania on the SAFE project, which is coordinated by Helen Keller International. The project follows the World Health Organization-endorsed SAFE strategy—Surgery, Antibiotics, Facial Cleanliness and Environmental Improvements—to address the underlying causes of trachoma. IMA addresses the backlog of trichiasis trachomatous cases, in which eyelashes have turned inward and scrape the surface of the eye. In such cases, surgery is required to relieve pain and prevent blindness. With funding from foundations, IMA Member Organizations, and private donors, IMA works to fight this highly aggressive but treatable childhood cancer through training health workers in diagnosis and case management as well as providing essential chemotherapy drugs. With funding from the CDC, foundations, IMA Member organizations, and private donors, IMA is working to stop the growing burden of cervical cancer in Tanzania through prevention, screening, and treatment for those diagnosed early. Globally, more than 27 million men suffer from filarial hydrocele, a fluid-filled enlargement of the scrotum, which leads to deformity and often involves the inability to work and provide for their families. This project supported district councils to establish an LF Morbidity Management program with a focus on hydrocele surgery to address a growing backlog of men who suffer from the condition. The program trained surgeons, nurses and anesthesia assistants at health facilities in hydrocelectomy by partial excision of tunica vaginalis technique, use of local anesthesia and patient care. Surgical teams performed procedures on weekends so they could attend to their usual patients during weekdays. During the project period, IMA supported surgical teams to carry out 1,320 surgeries—well above the target of 1,000 surgeries. The program used a cost share model, and Izumi-supported costs included allowances to the surgical teams and NTD coordinators, consumables used for the procedure, fees for Muhimbili National Hospital surgeons and costs associated with supportive supervision. The participating hospitals covered all other surgery and follow-up care costs.